We have a family New Years Eve tradition that began before we had children. My brother-in-law and his sweet wife invited us over on a New Years Eve, long long ago, right after we first moved to Florida. They had established a family Fondue Night tradition on New Years Eve. This was my first foray into tempura and fried vegetables and meat. I knew nothing of the chain restaurant The Melting Pot. Needless to say, because of my abiding love of All Things Fried, I was hooked. By the next New Years Eve, I had a newborn Emme. And the chances of us staying up to watch fireworks, much less cook our own food over a vat of hot oil were nil. And the children, they kept coming. Our dusty fondue pot sat unused for many years. I had to say nay to hot oil and extension cords in the dining room. 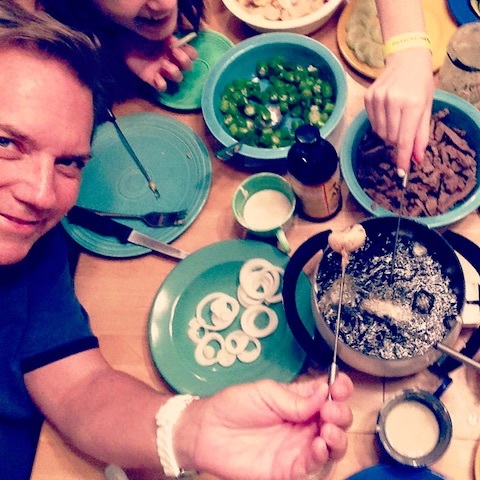 Last year, we thought it might finally be safe to reinstate the New Years Eve Family Fondue/Movie Night tradition. The teenagers of course scoffed, and the boy wasn’t all that happy at the sight of all the vegetables on the table. However, the evening was a success, and everyone enjoyed the fondue. And the chance to stay up extra late. Despite a back spasm that took me down for the better part of a day and a half, I rallied in time to pull everything together and we enjoyed an evening of Fondue. The movies will be shown once the kitchen is cleaned. (I sit at the keyboard with a heating pad while a teenager has cleaning duty. #Winning #minions.) In the spirit of full disclosure, and because Fiddledaddy threatened to rat me out, the cause of the spasm was my overly enthusiastic battle of cleaning the garden sized bathtub in our masterbath. Which I now am unable to enjoy. It helps the consistency if all the ingredients are chilled first. Simply mix well. I doubled the recipe for my family of 5. I buy pre-cooked packages of fajita steak and chicken, so no one has to visit the ER on New Years Eve. I’m guessing that would be gruesome. And besides, we’ve had two ER visits in the last week, so I’m over that. (Another story for another day.) I add raw zucchini, okra, sliced onions, mushrooms , and cheese cubes for dipping into the tempura and frying (all done at the table by each family member). I have color-coded fondue forks. I’m happy to report and no was set ablaze, scalded, or stabbed. If I’m feeling particularly spry, I add melted cheese and melted chocolate for dipping as well. Tonight, everyone will be making their own popcorn in a bag. On this New Years Eve I’m grateful for my family, my precious friends, many many blessings, Extra-strength Tylenol, and stretchy-pants. Happy New Years my friends!!!! When I lived in Los Angeles, I had a full set of cast iron cookware that I had procured from an estate sale. It’s not that I was all that adept at cooking, but I loved the vintage look and feel of all-iron skillet ware. And since I was single and living alone in Los Angeles, I justified the purchase as double usage cookware/weaponry. It was fortunate that I never broke a toe. After I married, I lugged the set of iron cookware with me, wherein it began to get some real use as I attempted to keep another person fed and alive. I loved that set. Alas, when we moved from California to Florida, every pound counted, so the cast iron cookware had to go. I’ve dearly missed it, especially this time of year when I have cornbread on my mind. 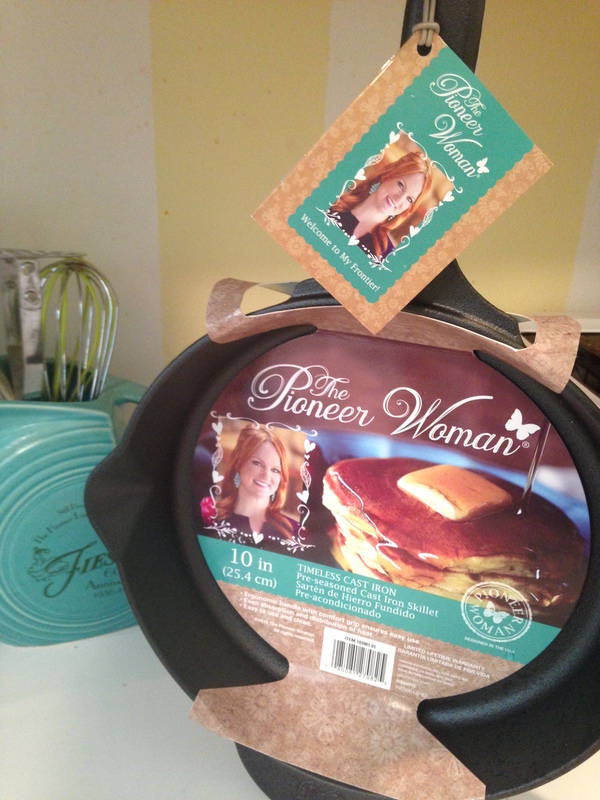 Imagine my delight when Walmart began carrying The Pioneer Woman’s dishes and cookware. So this last weekend I happily threw this into my cart. Her brightly colored display makes me smile every time I pass it in the store. I’ve been a fan since she first started blogging. I want to take whatever vitamins she takes to have THAT MUCH ENERGY. Let the Thanksgiving cooking begin. As a service project every year, my daughter’s American Heritage Girls scouting troop will sing Christmas Carols for the residents of a local retirement home. This particular retirement home is like no retirement home I’ve ever encountered. First of all, it smells delightful, is beautifully decorated, and boasts of a gorgeous library and sitting areas. It is one of the most cheerful assisted living facilities I’ve ever seen. I’ve told my children to start saving because that’s where Fiddledaddy and I want to be placed in our golden years. Either that or we plan to live with each of our children and bicker in the back seat of their car. And stash our underwear willy nilly throughout our room. I’m pretty sure they will spring for the nice retirement community. Anyhoo. It was dark when we departed the driveway. The girls are encouraged to dress festively. Cailey chose an oversized head bow with bright blinking lights. About midway down a dark desolate road she chose to turn the head bow on. Nearly causing me to crash the van. I thought for certain that a police car was wildly beckoning me to the side of the road as they had mistaken me for a wanted fugitive. Visions of unbecoming orange jumpsuits danced in my head. After my heart began beating once again, it occurred to me that yearly trips to the retirement home for caroling purposes are almost always fraught with excitement, as chronicled here from 3 years ago, and even further back in history here from 2006. The year the blogging began. My daughters were ages 7 and 5. Sob. Sob. There were no other inappropriate incidents to report, so I thought I’d share the recipe for the cookies we baked for the retirement residents. 1. Beat first 4 ingredients in large bowl with mixer until blended. Mix flour, dry gelatin and baking soda; gradually add to cream cheese mixture, mixing well after each addition. Refrigerate 30 minutes. 2. Heat oven to 375 degrees. Roll dough into (1-inch) balls. Place 2 inches apart on baking sheets, sprayed well with cooking spray (or you can use parchment paper). 3. Bake 9 to 11 minutes or until edges are lightly browned. Cool on baking sheets 2 minutes. Remove to wire racks; cool completely. 4. Sprinkle with powdered sugar just before serving. 1) It is COLD here in Equator, Florida. I’m not complaining, mind you, I’m just not climbing out of my flannels today. Which should make for an interesting day at the park. We will be pulling the picnic table out into the sunshine, since building a bonfire is frowned upon at public parks. Although we home schoolers call that science. 2) Nearly everyone I know has had some sort of dysentery/flu like plague on their house recently. So far we’ve been spared. But I’ve been known to keep the ingredients for the following soup on hand, as it is excellent to have readied at the first sign of the ability to keep food down once again. Plus as a lover of soup, it is one of my favorites. Saute onions/leeks in oil until they are transparent. Add the water (or milk). Bring to a boil. Add carrots and celery. Then add the potatoes. Lower temperature to a simmer. Let the whole thing cook for 1 hour. Add salt and pepper to taste. I’ve been known to add potato flakes to thicken it just a little prior to serving. Great with grated cheese and croutons. Have a terrific and healthy weekend, everyone! I’ve had an extraordinarily taxing weekend which resulted in a good deal of head butting with my teenaged daughter, resulting in jail time grounding which will end in 2013. Seriously. I told Fiddledaddy at church on Sunday morning that I was finished with blogging because I can no longer find the humor in my life. He assured me that someday, imagining my 13 year old daughter uttering the following words prior to church service, “I WOULD RATHER DIE THAN TO SIT WITH YOU” will send me into peals of laughter. Probably not today. Or tomorrow. But someday. Years from now when she has her own daughter, and I’m old and heavily medicated, I may chuckle. Maybe. Yeah. It’s been that kind of weekend. So. In times of stress, my mind turns to thoughts of food. I made a most amazing breakfast casserole for our small group on Sunday night. We decided that our theme would be Breakfast for Dinner. This is the type of casserole I’m going to serve on special occasions like Thanksgiving and/or Christmas morning. This recipe is super simple and can be mixed ahead the night before, and then shoved into the oven bright and early in the morning. Brown sausage and onion. Drain and mix with all the other ingredients (except the last 1/2 cup of cheese). Mix and place into large casserole dish (give the dish a shot of vegetable oil spray first to make clean up easier). Top with remaining cheese. Bake at 400 degrees for 40 minutes. I’m not even looking at the calorie count. We’ll just call this special occasion comfort food and call it a day. I’m off to nurse my sense of humor back to health. This feat may or may not include a carton of chocolate ice cream and an episode or 3 of Pinky and the Brain. Emme is working on her Cake Decorating Badge for American Heritage Girls. Which explains why I found bright pink frosting on my kitchen ceiling. Since A.H.G. is celebrating its 17th birthday this year, our troop threw a little party with cake provided by the Pipas (the junior and senior high girls). They made a patchwork quilt cake by each girl baking her own 9×9 cake, and applying the decorative frosting themselves. The cake was assembled together this afternoon. Thusly, a couple of badge requirements were signed off. I’ve never tried anything so fancy as to DECORATE a cake using real cake decorating paraphernalia. So I enjoyed playing assistant to Emme’s Galloping Gourmet. She did a fantastic job demonstrating different types of roses on her cake. And since canned frosting often doesn’t work as well in a pastry bag, one of Emme’s troop mates sent us a fantastic homemade icing recipe that I wanted to share. People, I know frosting. I’m the same gal who when experiencing a rather horrific day, was known to dig out an old can of tinted blue frosting from the bowels of the kitchen trash, and sit criss-cross apple sauce on the floor armed with a spoon. This might also mean that I have absolutely no taste or couth and anything goes when it comes to frosting. But I’m here to tell you that this was amazing frosting. In my humble opinion. A table top mixer is ideal for this, but since all I have is the same General Electric hand mixer that I bought in college, I must work with what I have. (It was fine.) Add the Crisco first, followed by the rest of the ingredients. It’s best to add a little of the confectioners sugar at a time. And sprinkle a bit of water around so that the 10X sugar will dissolve and not end up in your hair. Beat it for several minutes. 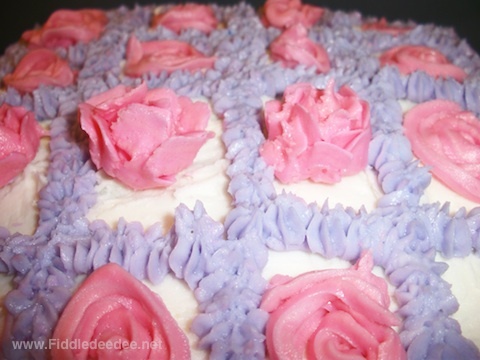 This icing is excellent for decorating and will not spoil. In other words, it doesn’t matter how long it sits in the bottom of the trash, it’s still redeemable. I wonder if Martha Stewart ever rooted around in the trash for snacking opportunities? I suspect she has and I am therefore in good company. A couple of weeks ago I was encouraged to drastically reduce my refined sugar and grain consumption, because likely I have a yeast overgrowth after being on antibiotics for the last 18 months. There went my two favorite food groups. 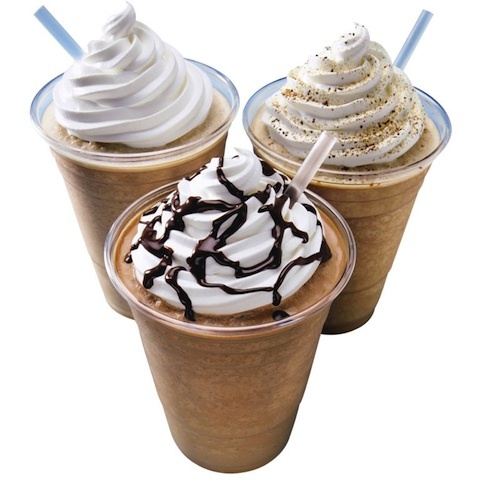 The most difficult aspect of this was that I had to give up my daily frozen blended mocha coffee drink. Years ago I discovered a coffee drink mix by Big Train Co. that would go on to save me hundreds of dollars on specialty coffee drinks. This is how I justified drinking them DAILY. Usually I choose not to read the calorie and sugar content, because ignorance is my best coping skill. However, in lieu of my recent doctor’s visit, and since my husband sat next to me and was a witness THAT I COULD NOT KILL OFF, I’ve had to re-evaluate many of my daily snacking options. The coffee drink had to go. The other day I was whining about my plight to a girlfriend of mine. This is a friend who is not only health conscious (with a website to prove it), but also knows her way around the kitchen. She told me I could replicate my favorite mix by using instant coffee and cocoa powder. I hung on her every word. She sent me the link for the recipe, and I tweaked it ever so slightly, because that’s what I do. I officially now love this new Coffee Drink recipe. Blend the whole thing in a blender or VitaMix. My friend Nancy also recommends using hydrated Chia Seeds, as they make it smoother and creamier. I haven’t tried this yet. You can also throw in a fistful of Spinach, because WOOHOO, can’t taste it in a blended drink. I don’t know if it makes a difference what kind of instant coffee that you use, but I am loving my Nescafe Clasico. It smells wonderful. I’ve always thought that instant coffee smelled like feet, but not this brand. Also, I’ve reluctantly given up Splenda and have replaced it with Stevia as my sweetener of choice. The best brand I’ve found so far are the Nu Stevia packets (found at my local health food store). I use two packets in my coffee drink. I also add a bit of cool whip. It makes it pretty. And I’m worth it. Thank you everyone for your healthy sugar-free, grain-free snack ideas! Much of what you all mentioned are some of my favorites! I’m going to likely go overboard with my love of homemade guacamole on tomatoes, roasted vegetables, and artichokes. And yes, I can have fruit, but I need to limit it to a couple of servings a day. Which is great because I can still have a green smoothie. I wanted to tell you about my most favorite snack recipe. I loved it when I was on the South Beach diet years ago, and had completely forgotten about it. You take a can of Chick Peas (garbanzo beans), rinse them, and let them air dry. Place them on a foiled lined pan. Drizzle about a teaspoon of Olive Oil, add some salt and garlic powder, and roast them in the oven at 350 degrees for about 50 minutes. They come out nice and crunchy. I’m loving these over Lays. Seriously. But I have to do 2 cans at a time because the children have discovered them as well. But one thing I can’t get right. I’ve been experimenting with Kale Chips. 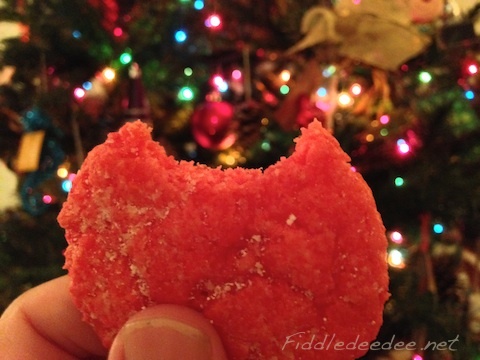 I’ve tried them in the dehydrator, but they come out as powder. 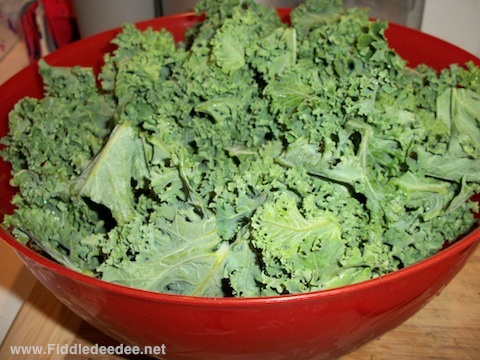 So I’ve tried putting the Kale into a bowl, drizzling with some Olive Oil, garlic powder, and salt. I work it all together and have tried baking it on a cookie sheet. It always comes out tasting a little bitter and burned. I’ve tried different temps and time. Still I can’t get it right. 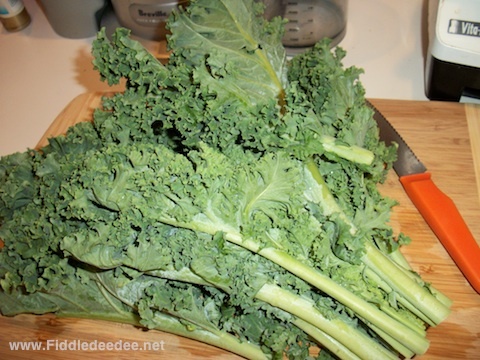 Does anyone else have a tried and true recipe for Kale Chips?